When Should A Muffler Be Replaced? What Is Done During Muffler Replacement? How Can You Save Money on Muffler Replacement? The majority of car engines would produce significantly more noise if it wasn’t for the muffler. It’s a carefully designed part which works to reduce the amount of noise from the exhaust system, and if there’s an issue with the part you’ll notice a substantial increase in the noise coming from the rear of your vehicle. While small holes can often be patched up and repaired fairly easily, more significant damage may mean your muffled will need replaced. Muffler replacement costs between $46 – $314 for the majority of cars, with costs varying depending on the parts required and the labor time involved. Below are a list of sample costs from the leading garage chains in the country. Many factors can influence the price, such as where you live and what kind of car you drive, so use these costs as a rough guide only. A muffler is designed to significantly reduce the noise that your car engine produces. Inside it is a set of tubes that are tuned in such a way that they reflect the sound made by the engine and cancel some of it out. The noise is created by pulses of high and low pressure air which forms when the engine exhaust valve opens and closes. The sound created from this effect travels faster than the compressed air molecules and arrives at the muffler before the gases do. The science behind this is similar in principle to noise cancelling headphones. 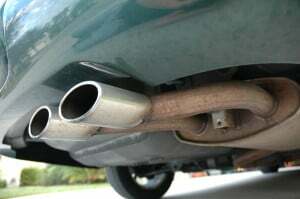 The exhaust gas enters the muffler through an inlet into a resonance chamber. From here it is forced into a perforated tube and released before being forced into a second perforated tube. The purpose of the tubes is to create a sound wave that is exactly opposite to the frequency initially created by the exhaust being released from the engine. The result is a cancellation of the sound before the exhaust gases are finally released through the muffler outlet. The main advantage with a new muffler is gas mileage. Over a period of time, sooty deposits can build up which impair the ability of a muffler to do its job. The muffler can break down inside with age and you may not notice it happening. Essentially the engine is being choked and its efficiency can drop dramatically. A damaged or blocked muffler can also result in engine starting issues. So if you getting less mile per gallon than you expect, then it is time to get the muffler checked. Carbon Monoxide (CO) leaking into the cabin – Carbon Monoxide is a colorless, tasteless gas created as a by-product of combustion. In small quantities it can cause nausea, headaches and dizziness, while heavier exposure can lead to death. Unacceptable noise levels can lead to criminal charges as many areas have laws that govern the amount of noise a car can make. Excessive noise in the cabin will make your journey uncomfortable. Engine damage can occur due to overheating or incorrect combustion. You should consider this when weighing up what a car muffler repair costs as it likely to be far more. The car is jacked up by the mechanic and made safe to allow them to go underneath. Penetrating oil is applied to all the bolts and clamps that need to be removed. There are usually fixings at the front and back of the muffler and the mechanic will allow time for the penetrating oil to do its job. The bolts and clamps are first loosened to ensure they are free then removed. The defective muffler is then freed from the hangers that hold it in position and removed. Jointing paste is applied to the pipes and joints before the new muffler is offered into position. The muffler is fitted and all pipes and clamps are tightened to the correct torque settings. Once the new muffler is in position, the car is started and the mechanic will make a detailed check for gas leaks and vibration. A check is also made to ensure that the muffler is not fouling on the underside of the car. The car can then be taken on a short drive to check for any noise or vibration. It is possible to replace the muffler on a car yourself, with the correct tools and equipment. It can save you on installation costs and you may be able to purchase the muffler for less than your local garage will charge. Carrying out maintenance on a car can be dangerous so always make sure that it is on a flat surface before attempting to jack it up. A car should never be left on a hydraulic jack when being worked on so ensure you have suitable ramps or axle stands before going underneath. The car should be left on park with the ignition keys removed, and always have a safety person in the vicinity. You will need a selection of tools including suitable size deep wall sockets, a hacksaw and a pry bar. Always remember to use penetrating oil before attempting to loosen the brackets and clamps. There are numerous suppliers who will happily sell you a replacement muffler and the prices do vary considerably. Buy the best you can afford as it will typically last the longest. If new clamps and hangers are not included in the deal, you will need to budget for them separately. Make sure that you have a suitable jointing paste for reassembling the exhaust and muffler. Tighten all nuts and clamps equally on both sides of the joint. Unequal pressures may lead to the muffler not seating correctly which will cause gas leaks and noise. It will also lessen the efficiency of the engine. Start the engine and listen. If it sounds right, it probably is right. Take the car for a test drive over a variety of surfaces were possible and check for any strange noises or bumping sounds. It is also advisable to re-check the nuts and clamps after the test in case they have loosened off. A correctly fitted replacement muffler will give many years of trouble free motoring, improve engine efficiency and enhance your driving experience. We’ve compiled some sample costs for having the muffler repaired on some of the most widely owned cars in the country. These costs can vary from place to place, so should be used as an estimate.